Today I am pleased to share my platform with my dear octogenarian aunt, Elsie who recently sent me this story that she wrote years ago. She never got the opportunity to publish her stories and I am delighted to share this one with my readers. Tonight my husband and I served a conservatively estimated crowd of 2000 at an impromptu fly in dinner. Some came gliding silently, while others arrived squawking in anticipation of the feast ahead. Unlike most social functions of today’s hustle and bustle, all guests arrived right on time, and without exception, unabashedly enjoyed their visit to the limit! Not one looked askance at the menu. Each and every one went home full, contented and appreciative. Between courses they very politely moved aside. They took the quiet moment to stretch, yawn or preen their dinner suits. They all looked so lovely in their basic white jackets, trimmed with grey, their black headgear and each so immaculately groomed. It appeared they had primped and readied themselves the whole day for this festivity. Not all conducted themselves according to Emily Post. In the beginning there was a certain amount of shoving and elbowing but when they realized there was more than enough food for all, they settled down to act the ladies and gentlemen they were. The only cleanup to do will be to wash down the tractor in the morning. Despite that, we wish them all well and hope to see each and every one again when we work the summer fallow the next time! It was one of those unexpected happenings that make you so thankful to be on the land and not in the city. The gulls had always visited as we worked a field, but not in the unbelievable numbers as this evening. They must have homed in on the only tractor moving for miles and miles. 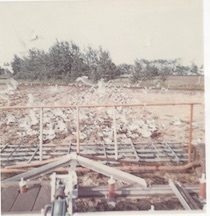 It felt like a scene from a Hitchcock movie, The Birds, with the gulls making the fallow white for a hundred yards behind, above, and to each side. Eerie but beautiful. Sadly, after years of spraying anhydrous ammonia on the fields, the seagulls disappeared. The soil may never recover. A hard lesson that some have yet to learn. 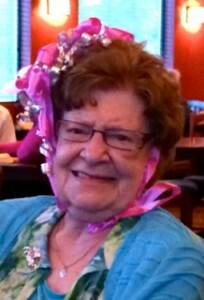 A new old friend, Betty recently celebrated her 90th Birthday by inviting 20 people to a buffet dinner in a local hotel. There were representatives from almost every decade in the last century, literally from 9 to 90! Betty has endured so many hip surgeries over the years that she has only one hip. As a result she is unable to walk or do much for herself. Caregivers come to her home three times a day to get her meals and help her in and out of bed. You might think Betty is sad or depressed. You might think she would feel sorry for herself. But not Betty! She may not be able to walk but she is a walking example of how to enjoy life. Betty has lived in her inner city home for 50 years. 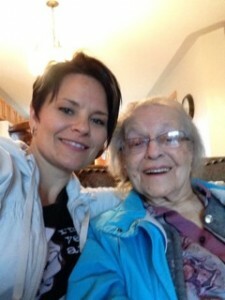 Her oldest neighbour, Mary was taken to a nursing home on the day of the party. That was sad for Betty. Part of her purpose lately has been watching out for Mary, who has steadily deteriorated over the past few years. First her hearing; now her, mind. She’s been showing up at Betty’s at 10:30 at night, thinking it’s morning and scaring the Dickens out of Betty. After five decades as neighbours, Betty and Mary are more like sisters than friends. Sadly Mary’s mental decline is ending their relationship. When Betty and Mary are both gone, their old homes will be dozed to make way for duplexes or mansions. Their decades of memories will be wiped out. Betty’s kitchen is like Grand Central Station. I pop in to water her flowers or bring Divot, our 14-yr-old Golden Retriever, whom Betty loves, for a visit. Invariably I meet a different person every time, having tea with Betty! Betty is determined to stay in her home until she dies. I hope she makes it. No matter how well meaning the “homes” are, they’re not the same as Home. The parade of visitors will slow to a trickle and eventually dry up. The staff is so harried and thinly spread, they have little time to interact on a human level. And the food is dreadful, almost completely void of nutrition and therefore, taste. No wonder people are dying to get out of there! At her party the guests inquire with each other about our connection to Betty. One woman said her parents lived two doors down the street. For years Betty drove them to the grocery store. “Knowing my parents,” she laughed, “they didn’t buy one drop of Betty’s gas, so this is payback for me!” In her tone, shone love for Betty and the honour she has in paying back Betty’s kindnesses. Have friends of all ages. And celebrate with them. Friendships take effort. It isn’t called “cultivating” friendships for nothing! I doubt Betty was thinking about being 90 when she was driving her old neighbours to the grocery store. Pay it forward is not just a cute slogan. It really works. One day when I’m old I hope to have younger friends who are willing to lend me a hand or an ear from time to time. I’m counting on good deeds being like stocks, paying me dividends in the future. Happy Birthday, and thank you, Betty, for your friendship, for your never-give-in spirit and for reminding me that longevity depends on friends. I am blessed to have had three mothers. My first mother, of course, gave birth to me. My grandmother assisted in my rearing; I consider her my second mom. Then there is my ‘finishing” mom. I call her that because she finished the job of raising me. You see, I was 17 when I married her son and like most 17-year-olds, I thought I was pretty smart. In reality, I knew nothing. Through her open heart, smiling face, undying service and unconditional love, she gave me many tools that have shaped my life. We bury her today. This is my tribute to Mildred Olsen. My grandma met Mildred through work. They became fast friends. Grandma started attending the church down the street and found the Olsens attended there. That’s where I first met my third mom. I remember her incessant smile. I also remember sitting behind her and seeing her rearrange the sausage curl at the end of her hair. I was 14 and had an immediate crush on her son. Three years later I became her daughter-in-law and she became my mother-in-law, a title she hated because of the negativity surrounding mothers-in-law and the ensuing jokes. She worked hard to dispel the stereotype and she achieved that. She always treated me as though I were one of her children. My Christmas and birthday gifts were as generous my sisters-in-law’s gifts. She both praised and scolded me (gently) as if she were my own parent. I never resented it. In fact, I loved the feeling of family she instilled in me. I imagine she was taken aback by my ignorance of keeping a home. As the oldest in my family, I was expected to labour outside on the farm. The extent of my kitchen skills were peeling potatoes, setting the table and washing dishes. She taught me how to cook. Not so much taught, but allowed me to observe and ask questions. I often helped her do her Christmas baking. I learned how important food presentation is. The tomatoes weren’t simply sliced, but neatly arranged on the plate. I still serve tomatoes this way. Her apple pie was legendary. In fact, Pastor DeMaere told me she made the best apple pie he ever ate and he had been served thousands of slices of apple pie over the years. A roast beef dinner evokes sweet memories of her Sunday dinners. Not only did I learn how to cook in her kitchen I learned hospitality. Mildred loved nothing more than having company. Out would come the coffee and squares or cakes. Her reward for serving her guests was their company. That suited me well. I am thankful I learned hostess etiquette at her side. In her kitchen I also learned how to clean. Her kitchen gleamed. Everything was wiped down daily and because of that regularity it was easy to keep it up. I will never claim to be as meticulous as she was but I learned how nice it feels to work in a clean kitchen. Her message was consistent: whatever you do, do it to the best of your ability. Go the extra mile. Make it look beautiful just because. I used to marvel at her energy. She was the first one up and the last to bed, always working, always doing, usually for others. When my babies came, she taught me how to care for them. She was their second mom and I always felt comfortable leaving my children in her care. I knew she loved them at least as much as I did. I am forever grateful that my children got to have all those comfortable memories of time spent at Grandma’s. She was our moral barometer. When the girls were teens and trying out racy language, they would claim it wasn’t so bad. “Would you say it front of Grandma?” They would hang their heads, “No.” Settled. If we were ashamed to do it in front of Grandma it was likely shameful. She and I used to talk for hours on the phone or play games Sunday afternoons when the men were napping off their big meal. Those conversations shaped my thinking. Mildred also influenced me by sharing her self-help library. To this day my reading includes self-help books, which most people find boring. Mildred had class, quiet dignity. She genuinely cared about people. She was happy in her roles of wife, mother, grandmother and homemaker. Luckily, I see Mildred in my girls. R____ has her darker skin and hair and voluptuous figure. She reveals her pain through her eyes, just like her grandma. She is also meticulous in everything she does. H____ shares her openness, loving spirit and her innate sense of morality. She thrives on company too. 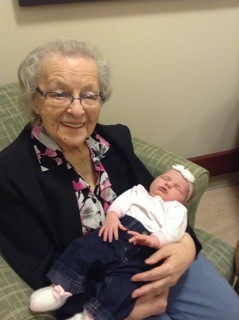 My girls both appreciate having known this wonderful woman and they acknowledge her profound influence in their lives. My grandma and Mildred were neighbours and friends for decades and forever connected through their descendents. In the last years they were in the same seniors lodge for a time. My grandma began to deteriorate. At one point she was unable to walk to the dining room for lunch. The lodge wasn’t exactly accommodating. One day my sister arrived at the lodge in time to see this: Grandma was perched on the seat of Mildred’s walker. Mildred, bad heart and bad hip notwithstanding, was pushing Grandma slowly towards the dining room. This image of my finishing mom supporting my second mom, regardless of the hardship it might cause her, is the statement of how Mildred lived her life. It is how I will forever remember her. In service to others in her own quiet way. With a smile and great love. 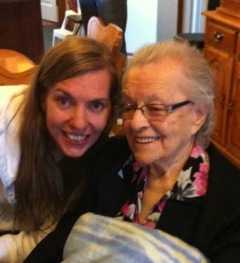 Thank you, Mildred, for finishing me, for being my grandma’s longest friend and for helping me raise my daughters. I could not have walked this way without you.